Brown dwarf bounty includes stunted "failed star"
Using the Japanese Subaru Telescope in Hawaii and the European Very Large Telescope (VLT) in Chile to study two compact star clusters, an international team of astronomers has discovered dozens of free-floating brown dwarfs, one of which is a lightweight six Jupiter masses. Brown dwarfs are often nicknamed failed stars – they don't have enough mass to ignite as fully fledged stars, and instead cool and develop gas planet-like atmospheres. As part of the Substellar Objects in Nearby Young Clusters Survey (SONYC), astronomers studied the nearby compact clusters NGC 1333 and Rho Ophiuchi at both optical and infrared wavelengths to identify brown dwarf candidates by their tell-tale red colours. The team then followed up by taking spectra with Subaru and the VLT. Brown dwarfs in the young star cluster NGC 1333. This photograph combines optical and infrared images taken with the Subaru Telescope. Brown dwarfs newly identified by the SONYC Survey are circled in yellow, while previously known brown dwarfs are circled in white. The arrow points to the least massive brown dwarf known in NGC 1333; it is only about six times heftier than Jupiter. Image: SONYC Team/Subaru Telescope. There were some surprising results. "For each brown dwarf there are about two stars in NGC 1333," lead author Aleks Scholz of the Dublin Institute for Advanced Studies in Ireland tells Astronomy Now. "In other regions this ratio is mostly in the range of 4-5 – it's 5.1 in RhoOph." The astronomers propose two scenarios that could favour the formation of brown dwarfs in this region, such as strong turbulence, or the presence of a strong gravitational potential due to the cluster, but Scholz cautions that these ideas are purely speculative at present. "The challenge will be to look at more diverse regions, to test different environmental conditions," he says. "Unfortunately most of the star forming regions in the solar neighbourhood are fairly similar, so, in the future we should try to extend this work to far away regions which are obviously much more difficult to observe." Amongst the brown dwarf bounty found in NGC 1333 was a particularly lightweight example, weighing in at just six Jupiter masses. Several other newly identified brown dwarfs are also particularly stunted with masses less than 20 times that of Jupiter, placing them at the lower boundary for known brown dwarf masses. Although comparable in mass to a gas planet, these low mass "failed stars" are an oddity because they do not orbit a star. "We observe these brown dwarfs free floating, but some of them might have formed in orbit around a star and got ejected very early in their evolution," explains Scholz. "Current ideas for the formation of gas giant planets do actually predict some ejected brown dwarfs. But the origin of our objects is unclear at the moment." 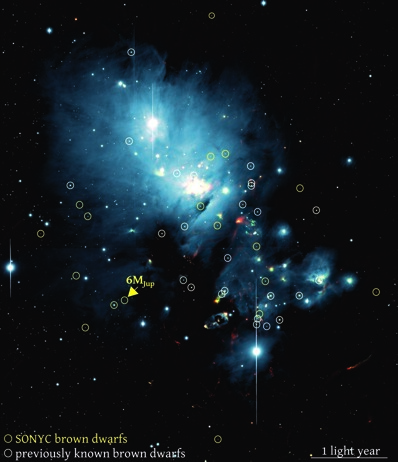 Two separate papers featuring in the Astrophysical Journal describe the results. Scholz's collaborators include Koraljka Muzic (who is lead author on the second paper) and Ray Jayawardhana (the Principal Investigator of SONYC), both from the University of Toronto.